After making several unsuccessful attempts to acquire an Atkinson Borderer for the museum, a Co. Meath family donated a variant that is, today, highly regarded by connoisseurs. In the late sixties, the advent of containerisation was accompanied by the arrival of articulated tractors in large numbers. During the period covered by their fairly short working lives, the British builders who supplied many of the first generation artics and at one time had almost a monopoly of the Irish market, were taken over or went out of business. It was therefore doubly fortunate that the Transport Museum was able to preserve, especially with the co-operation of CIE and Irish Rail, a selection of first generation models when they came to the end of the road. Examples from other sources included a classic Atkinson. From mid-1970 Atkinson Lorries (1933) Ltd., based at Walton-le-Dale in Lancashire, fought off an auction-like series of take-over bids by ERF and Fodens of Sandbach. During months of protracted campaigning by the prospective suitors, an unpredictable factor in the eventual outcome was the position of Leyland. This giant held a 20% share holding in Atkinson, which they regarded as a serious rival in the premium heavyweight market. Leyland remained silent until October when they backed a bid by a new contender, Seddon Diesel Vehicles of Oldham, many of whose models complemented those in the Atkinson range. Thus was created Seddon-Atkinson, which in turn was acquired by International Harvester, and is now part of Iveco. So fiercely loyal were Atkinson customers, however, that even after the mergers, they continued to place the celebrated ringed A badge on new Seddon Atkinsons and twenty-five years after the original take-over, the famous logo, supplied by Seddon-Atkinson, is regularly encountered on our roads. The explanation goes back to the basics of Atkinson: excellent engineering, reliability and economy. From 1916, Atkinson & Co. (then in Preston), were associated with steam wagons: first with sales and, later, repair and manufacture. Following a 1930 receivership and subsequent re-organisation, vehicle production resumed - with diesel-engined trucks. Atkinson Lorries, formed in 1933, developed a highly respected range, the basic design of which prevailed for over 30 years  but up to World War Two only about fifty lorries were made. Wartime Government orders boosted the company which achieved mega-fame after 1945. In addition to lorries, buses and specialised vehicles were built, suitably named models projecting the image of 'Knights of the Road'. By 1958, Atkinson cabs were glass-fibre, with wrap-round windscreens, but retained the distinctive radiator. In 1968 came a revised range with a higher-set cab, known as the Mark II, incorporating a moulded fibreglass representation of the radiator. New model names included the three-axle Searcher and four-axle Defender. O'Neill's of Pleasants Street, Dublin, were Atkinson distributors in the Irish Republic, the new vehicles they sold being supplemented by dealers' and operators' second-hand imports. Prestigious Atkinson customers included National Board and Paper Mills, Roadstone and Gypsum Industries. Several of today's leading transport people can still recall the powerful impression these vehicles made on their young minds. Jim Poots of Poots Coach Hire in Tandragee vividly remembers the Gypsum vehicles working between Kingscourt and Belfast, while Jerry Kiersey of Blueflite fame has such fond memories that he has acquired two old Atkinsons for restoration. More recently, another Atkinson enthusiast, Sam Stears of AA Waste, has brought in a splendidly restored four-axle tanker. The Atkinson Mark II series included a tractor - the Borderer, a fabled workhorse for nearly a quarter of a century. As with the other models, vehicles which worked here from new were joined over the years by ex-UK examples, and it is but a short time since the last ones were withdrawn. The Transport Museum made several attempts to acquire one, but were usually defeated by either the breaker or an owner whose tractor suddenly became gold plated when the Museum enquired about it. However, a Borderer finally came into the collection from a very public spirited owner in June 1994. 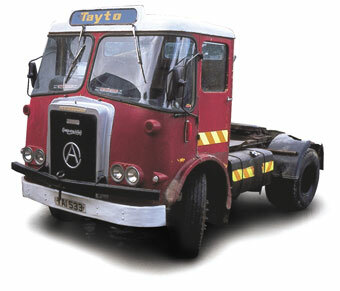 Patrick Whyte of Stamullen, Co. Meath, bought Borderer YAI 533 in January, 1975; it was one of the last to be built and was used for many years on a Tayto contract. Indeed, YAI 533 is the variant most highly regarded by connoisseurs: Gardner 6LX engine (10.45 litres, 150 bhp at 1,700 rpm), David Brown six-speed gearbox and Kirkstall axles - and traditional radiator outline with the circled A on the grill. On final withdrawal in 1994 it was presented to the Museum by the Whyte family. Looking at YAI 533 in Howth recently, Bill Montgomery of Belfast recalled that tractors of this type, while popular with drivers, performed much better laden than light: their dimensions and specification appealed particularly to fleet owners and they were generally known as 'Gaffers' Motors'. YAI 533 is one of four heavy artic. tractors currently in stock.